Was the so-called “Reagan Revolution” a disappointment regarding the federal systems of special-interest regulation? Many of that administration’s friends as well as its opponents think so. But under what criteria? To what extent? And why? When Ronald Reagan was elected in 1980, the popular belief was that the size of government would be cut and that some of the regulatory excesses of the prior decade would be rolled back. However, the growth of the federal government continued throughout the Reagan presidency and no agencies were phased out. What were the apparently powerful forces that rendered most of the bureaucracy impervious to reform? 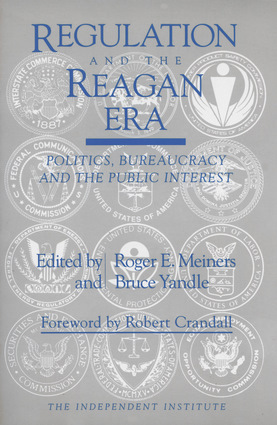 In this book, professional economists and lawyers who were at, or near, the top of the decision-making process in various federal agencies during the Reagan years discuss attempts to reign in the bureaucracy. Their candid comments and personal insights shed new light on the susceptibility of the American government to bureaucratic interests. This book is required reading for anyone wishing to understand the true reasons why meaningful, effective governmental reform at the federal level is so difficult, regardless of which political party controls the White House or Congress.